This canyon south of Tucson is hummingbird central in springtime, when swarms of them pause here during their annual migration. And it offers year-round opportunities for kids to marvel at other wildlife: Turkey, deer, and waterfowl congregate around Bog Springs’s 13 mostly oak-shaded sites, which sit near a lush riparian zone. Summer rain showers trigger bursts of butterflies, and a short nature trail winds through critter-spotting zones. $10; $5 park entry; vault toilets; no reservations; . Its water is a clear blue-green and its shore is edged by tall pines, with the peaks of the Sierra Nevada Mountains rising close behind. No wonder families and everybody else like Lake Alpine, off State 4 northeast of Arnold. Additional draws include swimming, trout fishing, and paddling the lake in kayaks and canoes you can rent from Lake Alpine Resort. Downside? This is a popular place in summer and campsites fill on a first-come, first-served basis—so go for a weekday visit. Showers, grocery, and fishing; $25; open late May–late Sep; no reservations; . Malibu is all about the ocean, and Leo Carrillo has two sandy beaches to roam, sea caves to explore, tidepools to inspect. The camp lies across the highway in a sycamore grove; a tunnel leads to the beach. Parents appreciate ranger-led nature walks, campfire programs, hot showers, and camp store for last-minute necessities. Bring your toys: stand-up paddleboards, surfboards, bodyboards, plus water sandals for the rock-strewn beach. And bring your dog; he or she is allowed in camp on the beach’s north end. Showers, grocery, and fishing; $45; $12/day park fee; . Tucked into a canyon, this 700-acre park on the south Big Sur coast preserves some of the oldest and largest redwoods in Monterey County. Kids love to splash around in Limekiln Creek, which runs through camp; campsites are creekside, beachfront, or in the redwoods. The park is named for its 1880s wood-fired kilns, which smelted limestone into powdered lime to make bricks and cement. Easy hikes lead to the kilns and a 100-foot-high waterfall. A small rocky cove is great for sunset and star watching. Hot showers are welcome luxuries. Showers and fishing; $35; $10/day park fee; . The dunes alone would make this park a must-do for families, but mid-May through June, the sands morph into a delightful swimming hole: Medano Creek’s ephemeral flow creates a shallow channel through the sands that’s perfect for water play. Reservations are essential—the 88-site campground often fills up during “beach” season—but the experience is worth the extra planning. Fishing; $20; $3/person park entry; . With Hahn’s Peak as a backdrop, this azure lake’s shoreline shimmers with wildflowers. 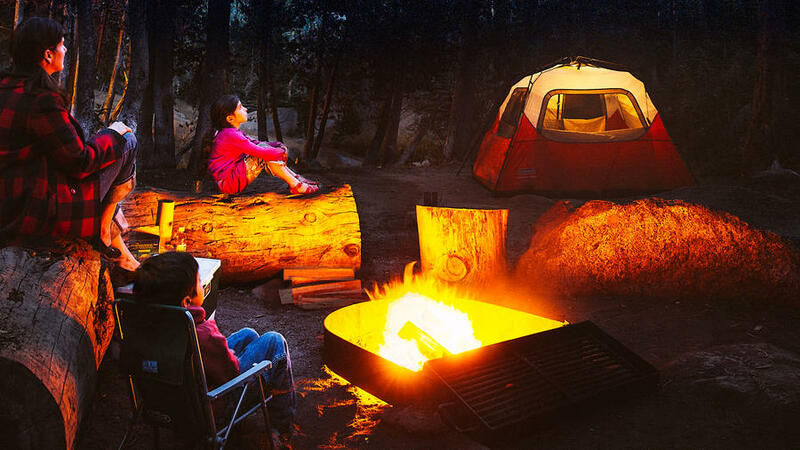 You could just soak in the pageantry from scenic campsites—if the kids would let you. But playtime will prevail. Rent paddleboats and canoes to explore the 1,100-acre lake, tangle with trout, or head out on expeditions on nearby hiking trails that plumb the pristine wilderness. From $16; or 970/879-3922. Book it: 800/678-2267. Wake to the sight of Lake Tahoe shimmering in the morning sun at this quiet 46-site campground occupying the sandy eastern shore, south of Zephyr Cove. Sites 22, 23, and 24 sit closest to the water and offer pine-filtered mountain views. A short walk to the swimming beach (Tahoe’s widest) lets families splash in relative solitude: This lakeside paradise almost never feels crowded, since the huge, nearly mile-long beachfront disperses visitors. Fishing; $32; open May 16–Oct 12; . Here’s your home base for (pictured). Climb in and out of Ancestral Pueblo cave rooms, complete with kid-friendly ladders. Then hike the 2.5-mile Falls Trail past two waterfalls to the Rio Grande. (Come in May, because June 1, the campground closes until next spring for restoration.) No reservations, but sites always available; $12; 505/672-3861 ext. 517. The military structures at Fort Stevens State Park protected the mouth of the Columbia River from the Civil War through the 1940s—and now they’re just one attraction at this 4,200-acre, 530-campsite tract along the Pacific 93 miles northwest of Portland. Nine miles of flat, paved biking trails? Check. Nine miles of easy hiking? Check. Beachcombing, a historic shipwreck, three swim- and canoe-friendly freshwater lakes, underground tours, and even a ride in a period military transport truck? But of course. And if hot showers are an attraction, well, the fort has those too. Showers, grocery, fishing, yurts/tent cabins/cabins, and RV/ trailer hookup; from $21; $5 park entry; . Parents will love the piping-hot solar shower and the proximity to Bend (early-morning latte run, anyone?). Kids will love floating down the lazy, crystal-clear Des­chutes River, leaping into swimming holes, and taking part in the Junior Ranger program—collecting passport stamps by identifying plants and animals and learning about the local environment. And no one’s going to complain about the surplus of sunny days at Central Oregon’s Tumalo State Park. Tip: The sites in Loop A are closest to the water. Snag one if you can. Showers, fishing, yurts/tent cabins/cabins, and RV/ trailer hookup; $21; $5 park entry; . Groves of insanely tall old-growth forest. A wild river that runs right through camp. A nature trail that winds past a bubbling hot spring. And, if you’re more adventurous, a 3-mile hike to a nearby waterfall. Ohanapecosh isn’t intimate—it has about 170 sites. But traditionally it’s where families visiting Mt. Rainier gather, marshmallows and all. Fishing; from $12; $15 park entry; . Once you pull into Salt Creek Recreation Area, you can stay put—no matter if your brood likes basketball, creek swimming, hiking, World War II bunkers, or beaches. Even better: Tongue Point Marine Sanctuary, on-site, has what could be the best tidepooling in the Northwest. And many of the 92 campsites have views of the Strait of Juan de Fuca; on a clear summer night, you might even be able to see all the way to the lights of Victoria, B.C. Showers and RV/ trailer hookup; $22; .